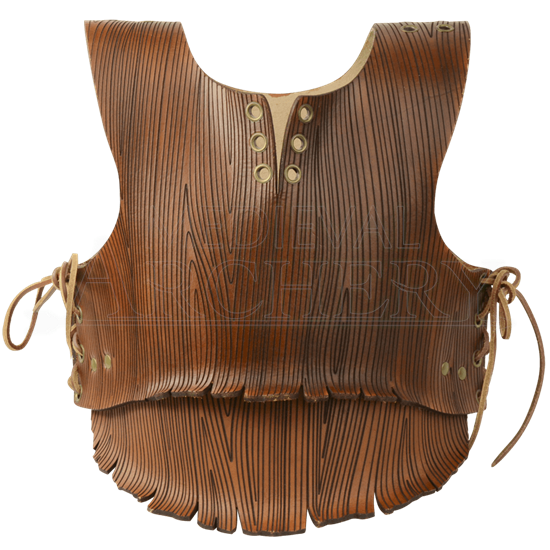 Perfect for young rangers and fae folk, this Childrens Woodland Warrior Body Armour provides lightweight and comfortable protection for LARP and other light combat activities. This leather harness is flexible and laces up the sides. Hand crafted in our shop from 7/8 ounce leather, this childs armour is finished with antique brass hardware. The brown leather has been engraved with a woodgrain design and molded with shaped edges to resemble curling bark. This leather harness features grommet holes at the shoulders so the matching Childrens Woodland Warrior Pauldrons (DK4108), sold separately, can be attached. Also sold separately is the Childrens Woodland Warrior Armour Belt (DK4004), which will extend the length of the armour and provide a nice layered look. The belt will extend the torso protection another 2 to 4 inches, depending on the height of the child. Be certain to check out all of our youth armour to build the perfect kit for your young combatant.